When living with a chronic illness it is easy to let all sorts of negative feelings creep in. Guilt, loneliness, fear, frustration, these are all common emotions among spoonies, and they’re not the only ones or the worst. The problem with letting such emotions linger is that they tend to cause havoc in our bodies, often making us more ill. It is important for people with any sort of chronic illness to find ways to reduce stress and negativity if they wish to feel any improvement. Don’t get me wrong, I am by no means saying that positive thinking will heal your very real and physical illness, but I do know that negativity and stress will absolutely make you worse, so the opposite must be true. You can improve your experience by improving your emotional and mental well-being. There are many ways that people can improve their emotional state: do something you enjoy every day, be kind to yourself, stop the negative self-talk, send negative and non-supportive people on their way, remove yourself from negative environments, surround yourself with positive, understanding and supportive people, meditate, pray, etc. Apart from all those very valid points, I found this list (either in Dr Myhill’s book or the support group, I can’t quite remember where), but I thought it was fun and quite relevant to anybody with chronic illness. It was written by Sylvia Waites, I believe she is one of Dr Myhill’s patients. 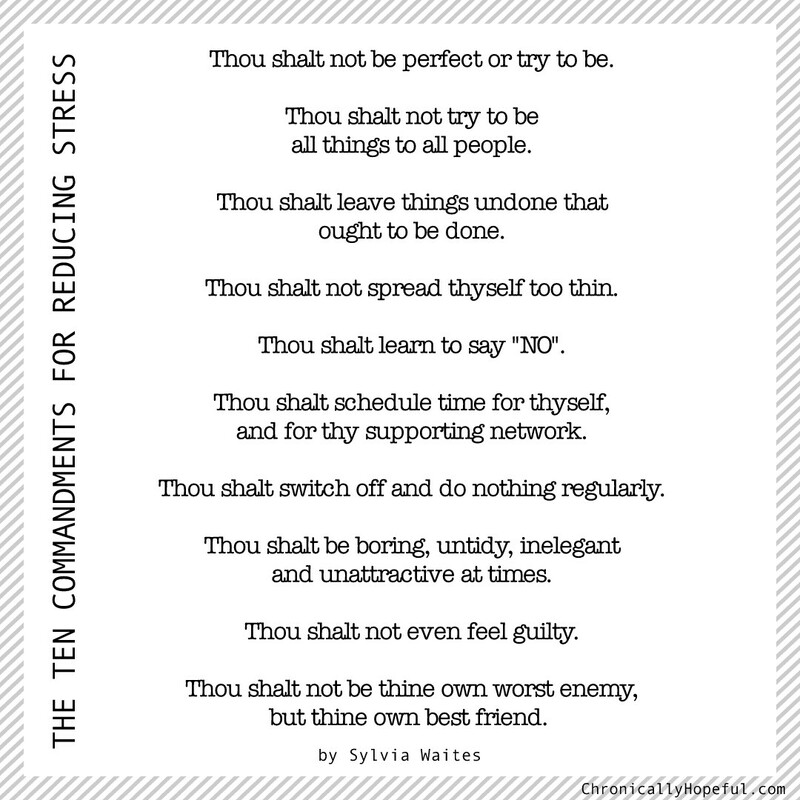 They are the ten commandments for reducing stress! Who wouldn’t need those? I have added my own thoughts under each commandment. I have found that many people with ME/CFS tend to be over-achievers, perfectionists and people pleasers. People who find it hard to stop. People who set high standards for themselves and others. People who are afraid to fail. This puts a lot of pressure on yourself. It is important to learn the art of letting go. Being a people pleaser can be a great quality out in the world, but it can be detrimental to somebody with chronic illness. We tend to keep pushing ourselves and end up causing flares or relapses which could have been avoided. You are not required or expected to be superman/woman! When we fall ill, we start to reduce our activity levels out of necessity, but at some point we stop reducing and try to keep up with all our responsibilities. We tend to feel guilty or inadequate if we can’t do all that we used to do or all that we think is expected of us, but when we are diagnosed with a chronic illness like ME/CFS, it is vital to slow right down and leave some things undone. Create a new schedule, skip days, alternate chores, delegate responsibilities to other members of family or recruit friends to help. Remember, if you can’t get to it today, leave it undone, it’s okay! It is extremely important that you learn to listen to your body. Be still and examine your whole body from head to toe. How does each part of your body feel: where is the pain, aching, tingling, shaking, burning, whatever it is you’re dealing with? All these symptoms will fluctuate with various activities. Pay attention to how your body responds to things and listen. An increase in symptoms in ME/CFS is usually a sign that you have overdone things and you might have to tone it down and cut back on certain activities or find less strenuous ways of doing them. I realise that for people pleasing perfectionists this one can be very tough! We thrive on making others happy, we thrive on acknowledgement and praise. We want to say “yes!” to everything and do the best we can at each and every commitment we make, but this is so dangerous in our condition. It is time to start saying “no”. If we continue accepting every request and invitation, we will eventually burn ourselves out. It really is okay and quite liberating to say “no” sometimes, it will take much of the pressure off. Thou shalt schedule time for thyself and for they supporting network. When we create a schedule or routine, it comes naturally to reserve time for all our chores and responsibilities and we neglect the extremely important responsibility: me time. This alone time is so beneficial not only to us as patients, but also for our carers. Taking care of somebody you love is not only physically hard, but is also emotionally hard. Nobody enjoys feeling helpless or seeing a loved one in pain. Make sure you take time to take care of your own mental, emotional and spiritual needs and let your carers know that they can take some time off. They might argue against it, but it’s in their best interests as well as yours. Nobody can pour from an empty cup. I often speak about listening to your body, but this can also be a problem because by the time your body starts complaining, it’s already too late. If you’re not severely affected and are still able to go out and work daily, then you may be able to go through your day with only 3 or 4 scheduled breaks, but for those of us who are housebound, it is so beneficial to take breaks between each and every activity. You will find that by giving your body this time to recover between exertion, that you can eventually reduce symptoms and start to feel a bit more normal, despite not being able to actually do all the “healthy person” activities. One of the big energy drains in my life is the bath or shower. I am so grateful that somebody told me on the day I was diagnosed that it’s okay to not shower everyday. I can pay for a shower or bath for one hour or for two days depending on whether I’m already in a flare or not. It really is fine to not bathe daily. At my best I’ve skipped just one day, at my worst, 8 days. Currently I’m at 2-3 days between baths. Pyjama days become a regular theme when you’ve been diagnosed with a chronic illness, getting dressed can be painful and draining if you have severe ME/CFS, as your management and pacing improves, you will reduce your symptoms and will be able to manage getting dressed more frequently. Your illness is not your fault. You are not to blame. Your body is going through so much as it fights day and night to heal and repair from whatever is going on inside. You need rest. You need peace. Your children love you anyway. You have no reason to feel guilty – unless you sabotage your own recovery. So often we speak negatively to ourselves, we put ourselves down and blame ourselves in ways that we would never insult or blame another person with such a debilitating illness. Be kind to yourself. We sabotage our own recovery when we push through the pain and think that we have to get all things done and take care of everybody else when we know we will pay for it. When you suffer, your loved ones suffer too, so take care of yourself. Make time to do things you love everyday. Do one thing that makes you smile. Whether it’s pamper time, working on a hobby, chatting with a friend, meditation or listening to your favourite music. Are there any other commandments you’d add to the list? Thank you for this beautiful post. I think we all realise the commandments are true but sometimes we need to hear it from someone else. They’re not all that easy to implement, are they?